While visiting home over the weekend, our mom suggested we bake a big batch of oatmeal chocolate chip cookies for the week ahead. Growing up, whether it was coming home late from an indoor field hockey game in Topsfield, seeking a sugar boost for after-school homework, or having friends over for an impromptu gathering, our mom always made sure to have the cookie jar filled with this go-to recipe. 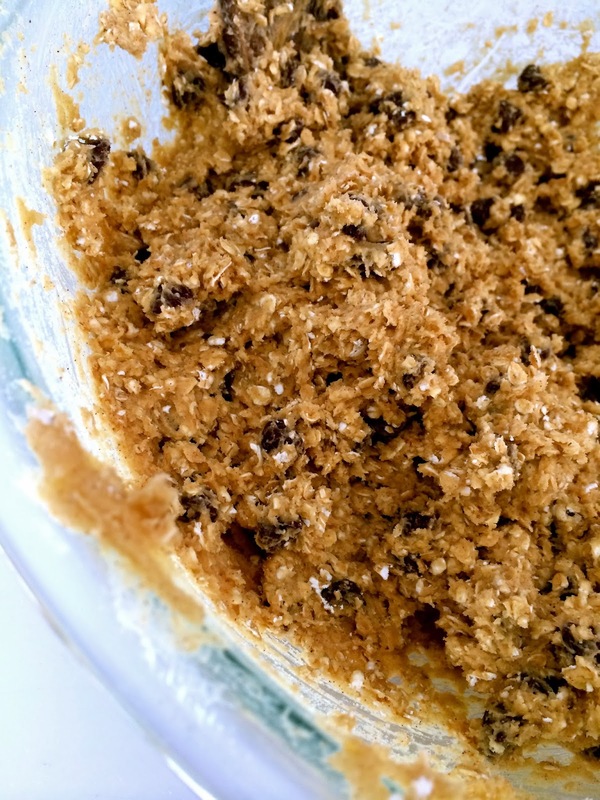 The combination of bittersweet chocolate chips and walnuts (never raisins) and a hint of cinnamon are blended into a chewy cookie that’s sweet, salty, and substantial. I drove back to Connecticut with a tin filled to the brim with the aromatic oatmeal and chocolate chip cookies. I keep a stash in the freezer for a pick me up after a brisk walk through the woods with Shiloh or to pair with my morning cup of coffee. In a medium bowl, whisk flour, baking soda, salt and cinnamon together. Set aside. In a large bowl, cream the butter on high until fluffy. Add the vanilla and eggs (one by one) until light and creamy. Add the sugar until fully incorporated. Using a wooden spoon, stir in the flour mixture in batches until just combined. Stir in the oats. Using your arm strength, mix until just incorporated. Stir in the chocolate chips and walnuts. Using a large spoon, divide the dough into equal portions, each about 2 T. Arrange the dough balls 2 inches apart on the baking sheets. Lightly push down each ball of dough with your hand and bake cookies until golden brown and still puffy, 11 to 12 minutes, rotating baking sheet halfway through baking. Transfer cookies to a wire rack to cool. Depending on the size, makes about 40 cookies. While forty cookies seem like a lot, they will vanish before your eyes!